At North Bay, forward Zach Poirier, a local kid from Mountain who played elite midget for the Upper Canada Cyclones, scored the overtime winner during a power play as the North Bay Battalion downed the Ottawa 67’s 3-2 in Ontario Hockey League action. 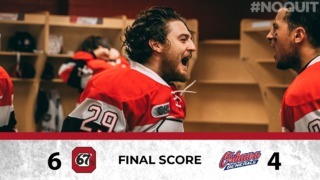 It was the first loss in overtime of the season for the Barber Poles, which picked up a point in the first of a three-game northern road trip, which continues Friday night in Sault Ste. Marie before ending Sunday in Sudbury. Ottawa captain Travis Konecny forced extra time by scoring the tying goal with four minutes remaining, but Poirier got the game-winner in extra time, taking advantage of an Ottawa too-many-men penalty. Ben Fanjoy also scored his third goal of the season off a pretty pass from winger Adam Craievich for the 67’s first goal of the contest. 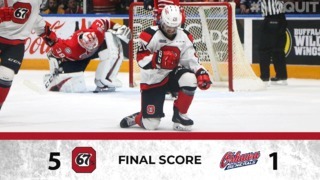 The next 67’s home game is Wednesday, November 4 at Canadian Tire Centre against the Kingston Frontenacs in the annual School Day Game. Face-off is at 10:30 a.m.
Ottawa returns to TD Place on Friday, November 6 at 7 p.m. against the Kitchener Rangers. Tickets are available here, or by calling 613-232-6767, ext. 1. 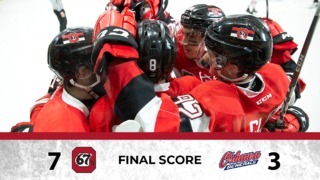 Youth hockey players in the Ottawa-Gatineau region can obtain free tickets to any 67’s regular-season home game through the 67’s Prospects program. Visit the 67’s Prospects website for details, or call 613-232-6767, ext. 1. 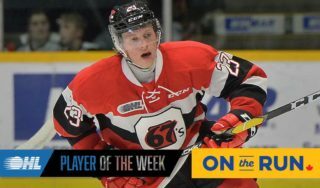 Upcoming 67’s games: Friday, October 30 at Sault Ste. Marie Greyhounds, 7:07 p.m.; Sunday, November 1 at Sudbury Wolves, 2 p.m.; Wednesday, November 4 vs. Kingston Frontenacs, Canadian Tire Centre (School Day Game), 10:30 a.m.